Law Automotive has been a family owned and operated auto repair shop since 1972, founded by Howard “Butch” Law. Butch’s son, Roland Law, bought the business in 1994. 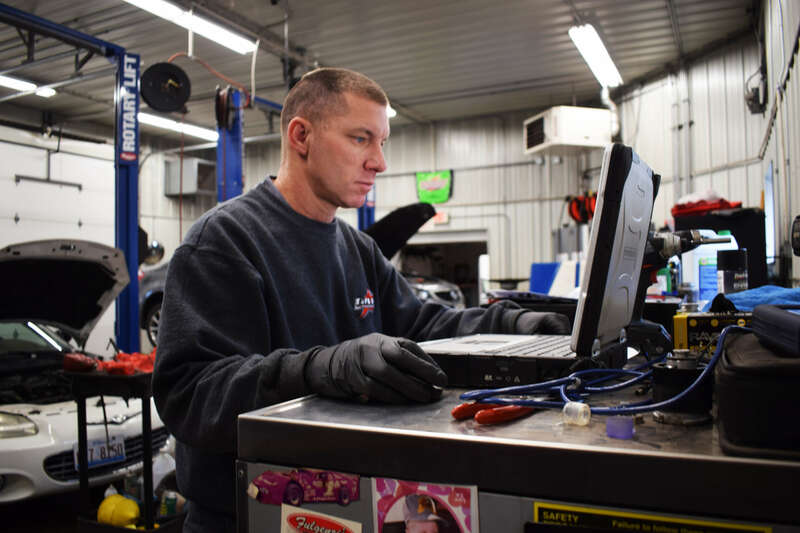 An ASE certified Master Technician, Roland, along with his wife, Stacey, updated the business, converting the shop to computerized technology and modern tools. They demolished the original shop in 1995 to make way for a new state-of-the-art three bay facility, and later in 2003, expanded to five bays. Roland continues the Law Automotive tradition his father began by personally servicing cars on a daily basis. He and Stacey, the office and business manager, lead a team of five full-time employees. The original, two-and-a-half bay shop was a one-mechanic operation specializing in engine rebuilds, brake repair, fuel and carburetion. Butch showcased his talents on racecars he owned, built and maintained, becoming well-known as one of the area’s best mechanics! Following in Butch’s footsteps, the Law Automotive crew has been deeply involved in motorsports for more than 30 years. What we learn on the race track directly benefits our customers. Knowing how to get the most out of a racecar enables us to get the most out of your personal vehicle. We’ve been 100% focused on providing wonderful customer care since 1972 when the shop first opened. We take pride in helping our customers protect their investments in regards to safety, dependability and longevity. The Law Automotive staff is professional, experienced, ASE certified and ready to offer quality service with an extensive warranty to protect you and your vehicle. We pride ourselves in being a much more accommodating alternative than a car dealership. Law Automotive is a sponsoring member of the International Automotive Technicians Network and a subscribing member of Identifix information systems. Our philosophy in life is to live by the Golden rule in every interaction with others. Both Roland and Stacey Law are very active in the local community. They have volunteered their time to help rebuild Williamsville Christian Church when their original church was destroyed in 2009. They have also volunteered as assistant coaches for YMCA Youth T Ball, Riverton Area Girls Softball Coaches, and ASA Fastbpitch softball coaches. Roland and Stacey have helped many area Boy Scouts with some of their various activities and badge requirements, including hosting such events at the shop. They are also active boosters and sponsors for Williamsville Sports Boosters. They have also mentored the area’s youth about contemplating a career in the ever growing, technically advanced industry of auto service. The Law family spent many years mentoring and working with NASCAR Driver Justin Allgaier in his early racing endeavors in and around Central Illinois. Work as if we are working for GOD, live your life for GOD to do good deeds. The most important lessons we can give future generations is the knowledge to know right from wrong, compassion, personal responsibility, and initiative because work makes us stronger and allows us to prosper. We are willing to come to your organizations and classes to talk about our industry. Our team is always happy to lead auto care lessons during a Driver’s Education class, or mentor any individuals that are considering a career in auto service. We care about your children and the future of our youth in regards to talking and texting while driving. You don’t need us to warn you about the dangers of inexperienced drivers trying to text and drive. We know that it is a worry on your mind every time they leave your driveway. If you’d like to bring your new driver in, we can arrange for a technician to talk to them about things “teens auto know” about basic car care such as how to change a flat, what the warning lights mean in the dash, how to check their fluids and not texting when driving. We want to pull alongside our customers with new drivers and help ease the burden of worry when their teens drive off on their own. We care about you and your children! Together, we can protect our future.